Although relatively fast, advanced users might find HostGator to be lacking in features. However, if you’re looking for a no-frills, easy to use web hosting service, then HostGator might just be the right service for you! Learn more. HostGator Review: 9 Pros & 5 Cons of the Gator! Next on our list of eligible web hosts is the ever popular HostGator, the sexiest most brightest looking web hosting service of them all. They’re known to be pretty. They’re known to be user friendly. But how does the ‘Gator hold up against the rest of the industry giants? Free dedicated IP (Business plan only)! How Does HostGator Hold Up Against The Competitions? Should I host with HostGator? To find out, we’ve donned our deerstalkers, requested blessings from the gods of journalism and subsribed to HostGator’s Baby plan to do some serious testing (tests that no one else bothered to do, thank you very much) just so you’ll know if HostGator is the right host for you. The results from our tests are actually quite surprising, but good things come to those who wait, and wait you shall for our verdict at the end of this review. Our two test sites are hgcloudhosted.com and hgbabyhosted.com. The former is hosted with HostGator Cloud Hatchling; while the latter is hosted with HostGator Baby. If you haven’t heard by now, here at Bitcatcha.com, we really like our web hosting to be fast. SUPER fast. And here’s where HostGator caught our attention. Considering the fact that they’ve only got 2 data centers (both located in USA mind you), HostGator managed to perform really well in Sao Paolo, Sydney and Japan, all hitting response times below 180 ms.
With a worldwide average of 171 ms, HostGator earned themselves an A+ from us! With the exception of PHP7.1 and a built in Apache-based content compression system, HostGator’s actually doesn’t have much going for them. They don’t use SSD storage (only available with cloud hosting, boo! ), no NGINX server set up or special caching features like SiteGround’s supercacher…yet the site load times are super fast! HostGator’s Cloud hosting is one of the fastest and most reliable web hosting services we’ve had the pleasure of using (check out our review here), so it’s saying a lot when we say that the shared web hosting’s site load speed is almost comparable to their cloud hosting! According to the test results, the shared hosting’s load speed is only slightly slower than our Cloud plan’s loading speed, and that’s pretty damn amazing considering the fact that the Cloud plan comes with SSD, speed enhancers, basically all the bells and whistles the world has to offer. Also, check out the TTFB between both test sites – the difference is negligible! We’re confident that with a bit of fine tuning and effort, we’ll be able to further decrease the loading speed even more and squeeze out as much juice as possible from our HostGator Baby plan! * Price includes unlimited storage & bandwidth, free SSL. Downtimes can be seriously detrimental to a site! It’ll cause you to lose potential sales, and worse – it’ll cause your site to drop in Google rankings, which means you’ll lose all those frosty first page clicks, which in turn causes you to lose MORE sales! 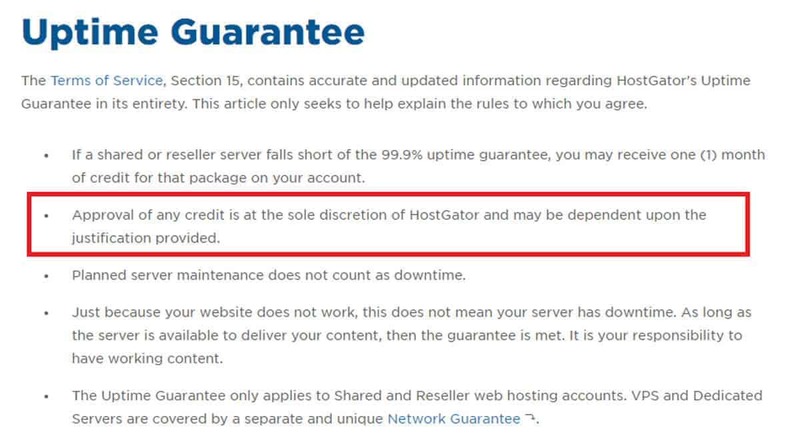 So yeah, downtime is a really big no no in the industry, so we’re pretty happy that HostGator’s plan comes with a 99.9% uptime guarantee, failing which, we’ll be reimbursed with 1 month’s credit to be used on our existing plan. However, with HostGator’s reputation of having solid uptime, we don’t think we’ll ever need to use their credits at all. Having said all these, there are some terms of the guarantee that we’re not really happy with, but more on that later in the cons section. I don’t know why, but the user interface of most web hosting services out there looks like it was designed by someone in the 80s that decided to walk out on the job halfway. With their bright colours, they’re the only ones with a UI that’s actually pleasant on the eyes, and not just that – they’ve made it super easy to navigate through the client login page! Everything is intuitively placed, with all important links and buttons located in places that naturally catches the eye, making the whole experience as user friendly as possible. This is particularly important to business owners, why? Because when you’re too busy figuring out which button does what and where to go to do something, you’re wasting precious time not managing your business, which means you’re not making money! With HostGator, you’ll easily be able to navigate through the client login and set up your site in no time, thanks to their UX designers! 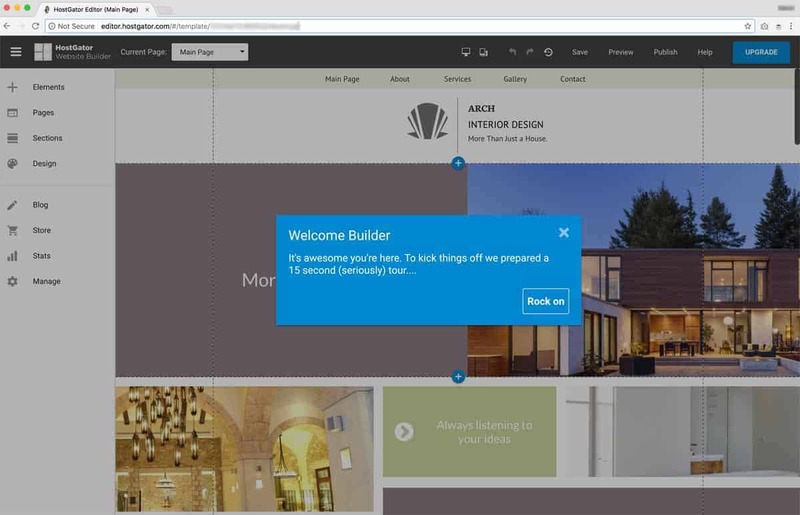 I think we can all agree that convenience and speed is key for business owners when it comes to site building. 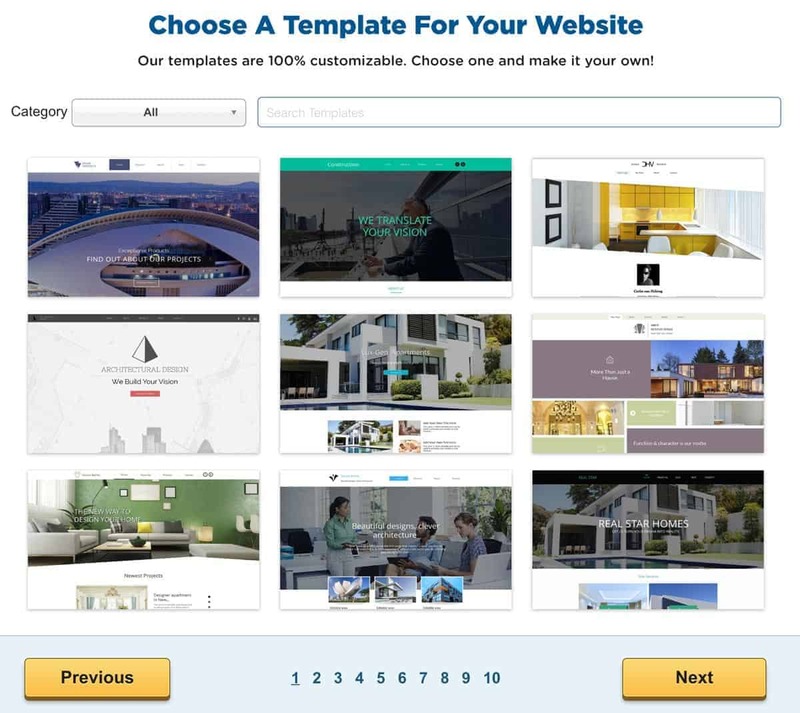 HostGator’s built-in site builder manages to do both, allowing you to quickly choose a template, customize it to your heart’s content and have it ready to go in just a couple of hours. They’ve got really professional looking themes, and once you’ve picked out one you like, you can personalize it with widgets, features, search bars, or anything you want. The whole process is fast and convenient, and it only took us a couple of hours to set up our test site (we had to revert it to stock WordPress for all the speed testing). The downside is that site builders usually aren’t optimized for speed, so there’s a trade-off for the convenience! You’ll also get to enjoy 1-Click installs, which makes installing your favourite apps super fast and unbelievably convenient! This allows you to get your site up in the shortest possible time, so you can literally get down to business and get those sales numbers up! All you need to do is click on the app you want, choose the directory you want it installed in and hit the install button – HostGator will preconfigure everything else for you! If you’ve ever had the displeasure of having something go wrong with your site with no one available to help you, you’ll appreciate a really responsive, strong customer service team. 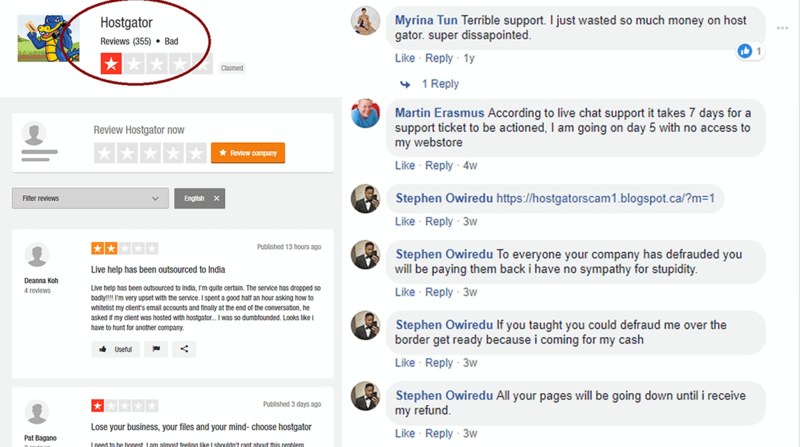 Our experience with HostGator’s customer support was generally quite good. Via livechat, we didn’t have to wait any longer than 3 minutes for them to respond and since our issues were relatively minor, they managed to get our site back online in just within 15 minutes! However, as of right now, submitting a ticket is not possible because apparently they are upgrading the ticketing system, so we’ll have to depend fully on their live chat, or we’ll need to call in. If you prefer not to speak to anyone, they’ve got a huge archive of knowledge base articles too so you can try to fix the whatever issues you’re facing by yourself! We’re pretty happy with their customer service so far, buuuuut we have a few concerns about how skilled they are when it comes to solving more complicated issues, which we’re gonna highlight in our cons section. 7. Unlimited / Unmetered Resources! 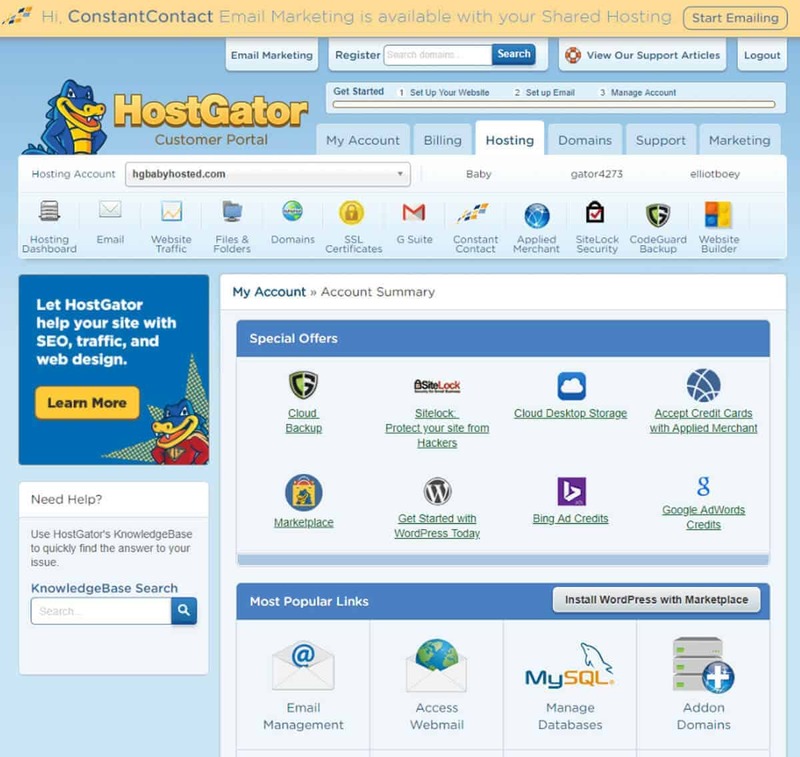 Get this – you get to host as many domains and email addresses as you want with HostGator! No more worrying about having to decide which domains to prioritise or having to pay extra for email addresses for new staff. Very future proof! You’ll also get to enjoy unmetered bandwidth and disk space, but these are limited to their TOS’s acceptable use policy. As long as you don’t abuse the system (e.g. storing backups of your backups on their system) or participate in peer to peer file sharing activities, you should be fine. 8. Free Dedicated IP (Business Plan Only)!! With the Business Plan, you will get to enjoy FREE dedicated IP and why on earth is this important? Well when you’re running an e-commerce site, you’re going to want to grab dedicated IP and SSL to keep your customer’s data secure and safe! It’s helps to create trust between your customers and your site, and that’s really important if you want repeat business from them! Most people will have to pay for this service (SiteGround charges $30 a year just for dedicated IP!) so to get it for free from HostGator’s Business plan is HUGE! There’s actually a ton of benefits that dedicated IP brings to the table but we’ll be covering that in another article in the near future. If you’re still on the fence then this might just help you decide if you want to host with HostGator – we’ve secured a crazy deal with them, exclusive only to our readers! Upon check out, key in “bitcatcha” and you’ll get to enjoy a whopping 60% off any of the shared and reseller hosting package plans (initial term only)! If you’re looking for Cloud hosting instead, don’t fret – the same code gives you 30% off their new cloud hosting plans, and 40% off any of their VPS, Dedicated or WordPress plans! Although HostGator performs pretty well on its own, (getting an A+ rank from us is not easy!) we can’t help but wonder how much better they can be if they’d made the effort to include some speed features, like NGINX server set-up or 1-click system optimizations! Right now, the only way to optimize and squeeze all the juice out of the server is to manually tweak and install plugins, which takes time and the expertise – something that most business owners may not always have on hand. So they’ve given us a 99% uptime guarantee, and they’re actually consistent with their uptime which is no doubt very good. What actually happens when their uptime dips below 99%? Will we get our 1 month credit as promised? You see, their TOS states that while we’ll enjoy one month credit for our packages if they uptime drops below 99.9%, the approval of the credit is at the sole discretion of HostGator. In other words, they can choose not to honour the guarantee if they feel like it. While we understand that HostGator needs to protect themselves against unscrupulous claims, having sole discretion on the approval of credit is seriously shady, and renders their guarantee completely moot. Okay, so they’ve earned cookie points for being really responsive, but we’ve got serious doubts about the ability of their support staff to solve serious problems. Speaking from past experience, it seems like their live help is outsourced to India (like most of EIG’s subsidiaries are) and most of the time, they are pretty useless at solving real issues. Furthermore, at the time of writing, we aren’t able to submit a ticket because apparently they are upgrading their ticketing system. We wanted to call them but we had to jump through hoops just to find their support phone number. Seriously Hostgator, what are you guys doing? This is another shady practice we’re not too happy about. When you’re at the point of purchase, HostGator’s intuitive UI tries to trick you into buying all the side products that you don’t really need. Make sure you look through your options carefully and uncheck the boxes to the things you don’t want, otherwise you’ll find yourself paying extra. Yes, you read right – HostGator only has 2 data centers and they’re both situated in the USA. If you’re in a country that’s further away and thinking of buying a HostGator account, you might want to check out this screenshot again to see if the response time is fast enough for you. What’s worse is that we don’t get to choose which data center we can use, HostGator automatically decides it for us! Having only 2 data centers is already not great but not allowing your customers to choose which data center they want to host with, that’s just uncool. Sure, HostGator has international subsidiaries in Asian countries such as Hostgator.in and HostGator.sg, but those are notorious for having really poor service, which really makes us not want to host with them. HostGator’s shared accounts come in 3 wonderful sizes to suit everyone’s needs. * Special introductory price for 36 months subscription period. If you’re looking to only host 1 site with no frills web hosting, then the hatchling plan works just fine, but personally we feel that it’s better to start with the Baby plan. It just costs slightly over a dollar more per month, and you’ll get to host as many domains as you like! Of course, if things are going well, you can always opt to upgrade to the business plan and enjoy all its exclusive services, like free SSL, Dedicated IP and VoIP phone service. As we’ve mentioned before, these little extra luxuries actually go a very long way in making your e-commerce site look extra legit! Again, you can go with hatchling cloud if you really want to cut down costs, but you get so much more with Baby cloud. As with the shared hosting plans, you’ll also have the option to upgrade to the Business Cloud plan when you see fit. They’ve also got WordPress Cloud plans! Now these plans are completely different from the shared and cloud hosting plans in the sense that they are optimized for WordPress and you get to host maximum 3 sites, even with the business plan. 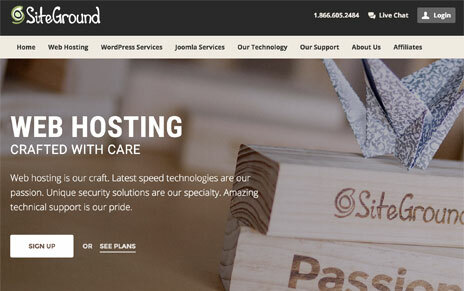 HostGator VS SiteGround – Which is better for WordPress? We couldn’t help but compare HostGator to our current favourite web host, SiteGround, so let’s have a look the features each company has to offer. When placed side by side like this, it’s pretty obvious which web hosting provides you with better value for money at roughly the same price range. 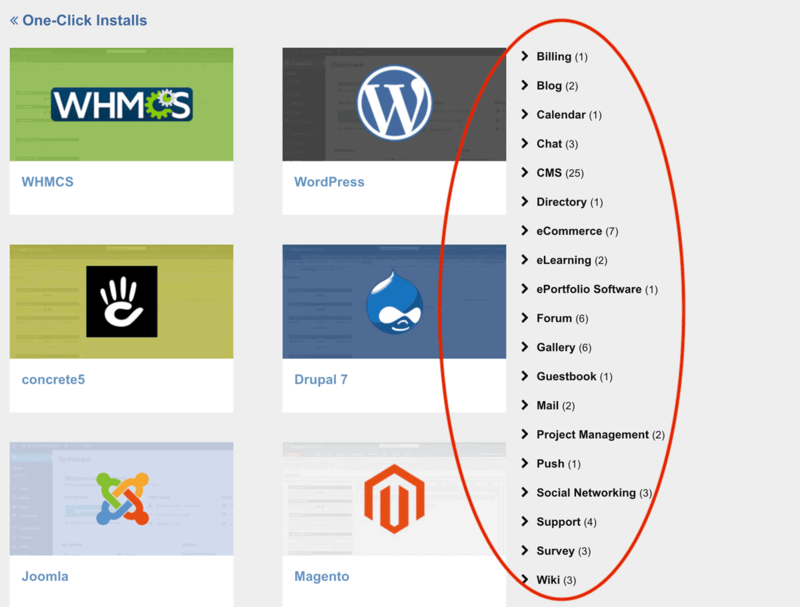 HostGator’s 1-Click installs for WordPress is awesome, and really helps save so much time, but SiteGround has the upper hand when it comes to features. We save so much more time with SiteGround’s SG optimizer and Supercacher (no need to manually tweak and install plugins) and their free SSL and daily backups bring so much value to the plan! Also, let’s talk data centers – HostGator’s 2 in USA versus SiteGround’s 5 spread out across 3 regions. Although HostGator’s server response times are actually pretty fast, countries further away may not be able to fully enjoy their advertised speeds due to the distance. With SiteGround, you’ll get to be able to pick a data center which is closest to your location, which definitely helps with server response time. Having said all that, there’s no perfect web host out there. Each one has their pros and cons, even our beloved SiteGround (we don’t like how expensive their renewals have gotten – read more here). With HostGator, the tradeoff for their lack of features is their user friendly UI and their super low entry level pricing. You’ll be hard pressed to find another UI like this at their price point! For a more in-depth comparison between the two, read our analysis here – SiteGround VS HostGator. As we’ve mentioned in our Inmotion Hosting review, their built-in BoldGrid site builder is pretty damn awesome. While HostGator’s very own proprietary site builder is indeed very good and easy to use, it’s got nothing against BoldGrid. If you’re just looking for something that’s convenient and makes your site look good without any tweaking then HostGator’s site builder does the job just fine, but if you want more complex controls and custom options, HostGator ain’t gonna cut it. BoldGrid is slightly more complicated to use, but offers so much more in terms of customisation. They’ve got more tools so you can perform more complex manoeuvres, and best of all, the site you design with BoldGrid as yours to keep as your own, so site migration shouldn’t be a problem if you decide to change hosts! 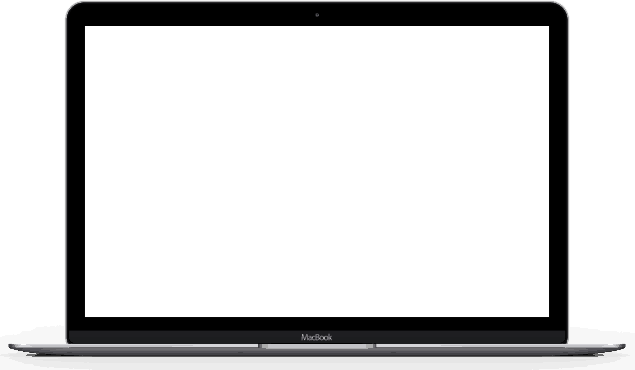 However, you should keep in mind that BoldGrid is a Premium web builder that comes free with Inmotion Hosting, while HostGator’s site builder is just that – a free site builder. For what it is, HostGator’s free site builder does its job just fine. Verdict: Should I host with HostGator? We’ve gotta say that although we feel good about about HostGator, it really doesn’t make us feel great. They seem to be catered to a host-and-forget crowd, a demographic that doesn’t really care about optimizations and tweaks. If you fall into this category, the HostGator is actually the perfect host for you! You won’t have to worry about anything whatsoever. They’re really easy to use and intuitive – just install, customize and you’re good to go! 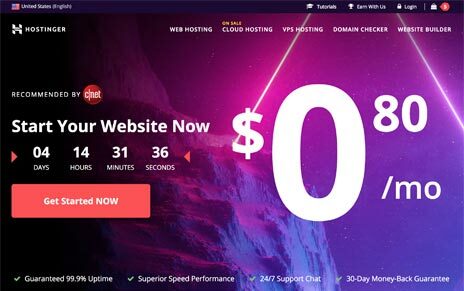 However, if you’re the kind that likes to tweak, optimize and do whatever it takes to get the most speedjuice out of your web hosting, you may not like HostGator so much. We feel that they’re trying to take away as much control as possible from us just so they can ensure that their systems run without hiccups – as mentioned above, it’s great for the non web hosting savvy crowd but if you know what you’re doing, this feels fairly restrictive. What they lack in features, they make up for in ease of use. Their UI is just so intuitive and easy to use, i’m confident my grandmother could create a simple site with HostGator. Speedwise, we’ve got no complaints about HostGator’s server response times. They are relatively fast, as evidenced with the test results from our unique server speed checker. However, we don’t like that they’ve only got 2 datacenters (both based in USA), and that they don’t allow us to choose which one we want to host with. Their need to hire better skilled people in their support department (or maybe not subcontract it out to India), but credit given where credit is due, they are very responsive. Aside from that, I think we’re pretty okay-ish with HostGator. ** 45-day money back guarantee.